'Course, Masha hasn't put up her linky yet over at Piękno, so I'm just stealing her meme until she does. Feeling... bright and cheerful. The sky is bell-clear, and it's honest-to-goodness hot outside, about eighty degrees (go ahead and laugh, all ye who are not from the Pacific Northwest). We get heat like this so rarely that I think of it as splendid. 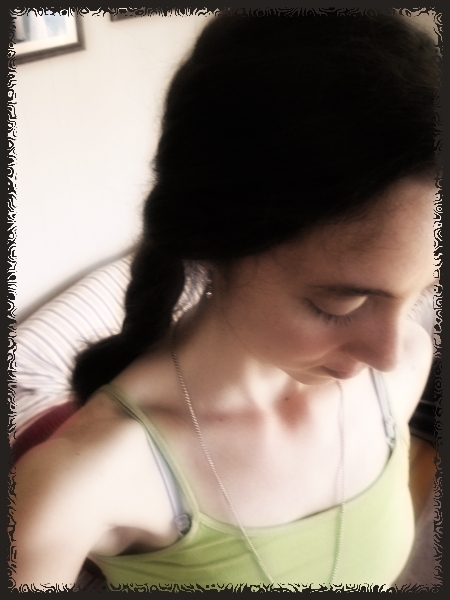 I'm in tank tops and shorts and French braids and enjoying every bit of it. Also, I've just had two extraordinarily pleasant days, on which I shall elaborate under the later sensory headings. Seeing... bright blue sky and summer flowers; the first buds on my sweet peas; half-grown baby tomatoes (weeks earlier than we had last year, I think); the first female flowers on the pumpkin vines. Smelling... the light, spicy scent of a glass of holy basil (tulsi) tea. Tasting... homemade einkorn flatbread and pico de gallo, fresh fuji apples, and "doubled" eggs, all courtesy of my little sister. Listening... to the strange whistling roar the WTA buses and semi-trucks make going by on the street. Grateful... for everyone's prayers about my choir directing yesterday, and for a blessedly supportive choir and musical team. I felt very prayed for and loved, able to relax for the most part, to take little mistakes and difficulties in stride, to keep track of the cues, to be decisive, and to freely enjoy myself. And I was surrounded by helpful people who knew just what they were supposed to do and when. Seriously: if you prayed for me, thank you. There was a memorable moment during Mass when I thought of all of you who had offered prayers, understood how much they were helping me, and was grateful. Reading... the last two chapters of Harry Potter and the Sorcerer's Stone, in preparation for tomorrow. Loving... my little sister-who-does-not-like-to-be-named-on-the-internet and her daughters, with whom I spent a happy late morning and early afternoon. Lots of cuddles and smiles, countless instances of "Watch me! ", four small hands helping me peel and mayonnaise the eggs—and spreading both egg peel and condiments over half the kitchen in the process—and coffee and shared thoughts and the occasional movie quote with my sister. Hoping... that I'll get asked to substitute-direct again sometime. :D Even though I never like having any of our team missing. Yay! Thanks..I finally got it posted this morning, I've been pretty much completely non-functional for the past week. I'm so glad you enjoyed directing the choir!! How terrifying..and thrilling it sounds! It's hard to be functional in heavy, persevering rain.